Burgers are a delicious thing to make on the grill for dinner during the summer or grab for lunch while you’re out running errands. But, you might have never thought about eating one for breakfast! Our recipe for ham and egg burgers could become your new favorite thing to eat for breakfast. If you love a delicious, hearty meal to start out your day, this dish is the perfect thing to make. Whether you have a busy day at work or your kids have a lot of activities to get through, you need enough energy to stay alert all day. Having a good breakfast in the morning is a great way to start your day off right. And, these burgers aren’t just for breakfast. If you love breakfast for dinner, this dish makes a great meal for dinner or lunch, too. 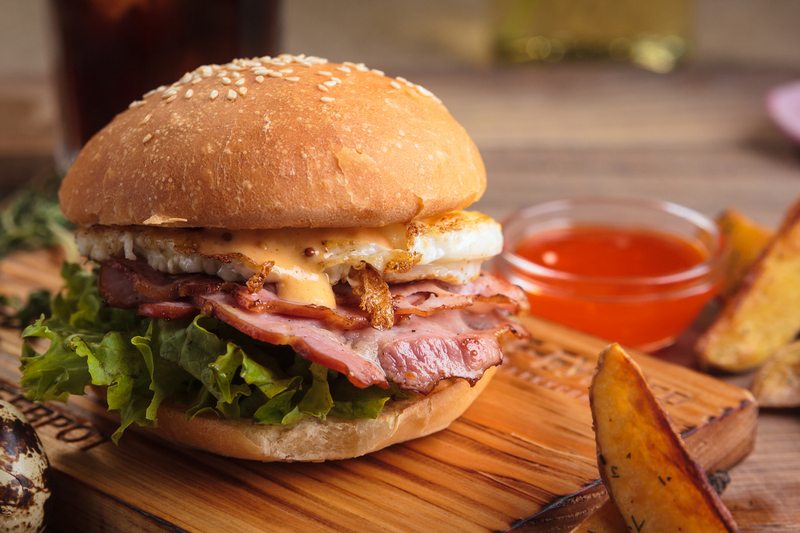 Check out our ham and egg breakfast burger recipe below to get cooking! Form the burger patties. Divide the ground beef into four equal sized balls. Form each ball into a patty and use your thumb to indent the middle of one side of the patty. Season each patty on both sides with salt and black pepper. Cook the burgers. Melt the tablespoon of butter in a cast iron skillet over medium heat. Cook the burgers two at a time for three to four minutes on both sides. When the burgers are almost done on the second side, add a slice of cheddar cheese and allow to melt completely. When all of the burgers are finished, put them in a dish, cover it with aluminum foil and put it in the oven to keep the burgers warm. Prepare your poached eggs. Crack each of your eggs into a small cup or dish. In a large saucepan, add enough water so it comes about an inch below the top. Add your salt and vinegar. Heat the water over medium heat until it simmers. Carefully drop each egg into the simmering water. Remove the pot from the heat, cover it and allow it to sit for five minutes. Do not disturb the eggs at all or remove the cover. While the eggs are poaching, build your burgers. Place some leaf lettuce on the bottom bun, add the burger and then the ham. Make sure to take the eggs out at after five minutes. Remove them from the water with a slotted spoon and cover them over the ham. When you’re making this egg breakfast burger recipe, make sure to use Sauder’s eggs to give it a little something more. Be sure to use our store locator at the nearest retailer to you.